Great Haywood was my first experience in the role as volunteer market leader. What did I learn? The Facebook Messenger group set up for the market made me feel I already knew most of those attending and any slight apprehension gave way to a more relaxed feeling the closer the market came. Being on the steering committee I knew how much work had already been done behind the scenes by Ronni Payne, our markets manager, Sue Meades and others, so was pretty confident that all would be well on the day. Knowing that Ronnie would be monitoring Messenger made me feel even more relaxed; I knew that if I needed urgent advice it would be forthcoming very quickly. Arriving early seemed to me to be one of the most important aspects of market leader so I planned to leave in good time for the venue. Unfortunately, frantic last minute maintenance issues brought about by the ‘Beast from the East’ made sure my composure was sorely tested and it was a far from relaxed Mr Shipshape who began the journey to Great Haywood, now seriously behind schedule. After some hard cruising we pottered by the venue on Tuesday evening, the day before set up, passing some of the traders that would be attending holed up in various locations on the way. It was a relief to see the CRT market notification signs were neatly in position and there were no boaters on site. We chugged on to the winding hole which, my goodness, is easily a 3 hour round trip from the venue. If there is an argument for being above the lock, the distance to the winding hole would weigh heavily in its favour. Located here, traders could reverse up to the junction and turn without facing the long journey almost to the outskirts of Rugely and back! But I imagine this is the kind of local knowledge and feedback RCTA need to make the next market we hold here even better than the last. Next morning we arrived almost exactly on time with ‘Mugs Afloat’ just mooring up in the number one spot,. 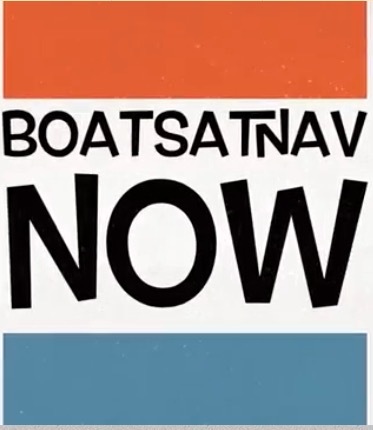 My biggest worry was how was I going to make sure the boats were placed in their mooring order according to the plan? I soon realised that the mooring rings were about 15 yards apart and that made it quite easy to work out where everybody should go. Unfortunately, some local bigwig had built a bridge to Shugborough Hall in the middle of the venue which made my calculations a bit more difficult but in the end I needn’t have worried. 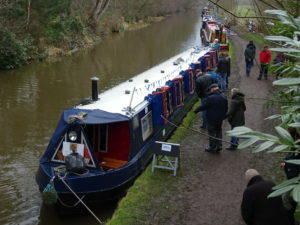 Amazingly, each trader came to the venue in exactly their mooring order so they just slotted onto the end of the queue. While waiting for everybody to arrive my task was to keep other boaters from settling down on the mooring. I soon realised that you needed to get to them early before they had gone through the rigmarole of mooring up if you wanted to keep them sweet. 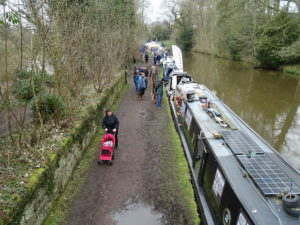 At Great Haywood, especially at Easter, there is no pressure on moorings because there is miles of space and everybody seemed happy, after a bit of token harrumphing, to move on. Thursday was full of bustle as traders began erecting any number of different weather proof display systems. These were interesting just in themselves and as I walked round I kept thinking to myself ‘why didn’t I think of that?’ We were all jealous of Dave on Anon’s self contained and hurricane proof workshop. Bunting began to be put up and flags began to wave gaily. I began to feel excited and proud of our market. The next job was putting the signs up. I had forgotten Sue Meades had volunteered to do this and took it upon myself to wander round putting signs up in strategic places. Great Haywood is a very extended venue with several entry points and needs a lot of signs mostly pointing to the left. I just about had enough but I made a mental note to print off and laminate some extra signs for the next time I volunteer for this role. Also to remember to take plenty of long zip ties. Sue supplied me with these otherwise it would have involved fiddling with parcel string. Not a good idea. Once the market started everything should have been plane sailing. I imagined my role would be to stroll up the market every now and then to check if anybody had any problems, pick up some litter and chat to visitors. But then the rain came. Mostly overnight but enough to turn the towpath into a quagmire. Luckily Brin from ‘Crafty Arthwyr’ had a stiff broom and showed the way by sweeping the puddles into the undergrowth. This revealed a lovely red crushed brick hard surface which unfortunately soon disappeared again under a layer of slurry as the rain continued to fall. Weather wise, Friday was excellent, Saturday and Sunday not too bad if as a visitor you came anticipating a muddy towpath (most did) but Monday was a deluge. It very soon became apparent that the market had to be cancelled as the site became too dangerous for visitors and traders alike. I must admit I am prepared to put up with most things to keep the shop open but this was utterly exceptional. As I trudged round in the rain taking the signs down which by now had dissolved into shapeless lumps, it was reassuring to note that there was not even the hint of a visitor beyond the most determined dog walker. I don’t think closing early made too much difference to what was already a bad situation. All the traders maintained a stoical cheerfulness throughout the rain. Some experienced damage to their structures due to the weight of water that built up overnight and I should think everybody had to deal with mud gradually making its way from the towpath, up the side of the boat and into their living quarters. Next time I will make sure I bring my own hard brush and a small spade so we can clear puddles more easily. On Saturday Mark and Justina Evans from ‘Grand Rosettes’ invited us all to visit the village institute. What a gem this place is! Warm and homely with good beer. As a bonus we were entertained by a singer who was not just good but very good and apparently kept going until last thing. Finally Annie from ‘Crafty Heron’ arranged for us all to have a lovely end of market meal at the Cavendish Arms which brought our market to a notable end.. Thanks to all my fellow traders for making it such an interesting and enjoyable event and yes, I will volunteer to do this again. It was fun! Andrew Mills is Mr Shipshape from ‘Make it Shipshape’.